Well, the good news is that this episode wasn’t devoted to Rick helping Carl adjust his sheriff’s hat so it fit more snugly upon Carl’s sweaty, sweaty brow, as Rick warned he would do in last week’s episode. The bad news is that Sophia is still missing. We begin with a flashback of a row of unmoving cars stretched out on a highway. Because that’s an image we haven’t seen this season yet. Except instead of our dopey crew, there are a bunch of extras there, too, fresh off the set of Lost, just shooting the breeze and going off by themselves to pee in the dark. Carl and that little girl are playing checkers. Carl’s hungry and Carol tries to offer up one of Ed’s MREs, but he stops her. “Sorry, I guess we forgot to pack them,” Carol tells Lori. “It’s all right,” says Lori, because that sounds like a perfectly fine excuse to her since apparently she and Shane did actually forget to bring food with them. I guess it just wasn’t a priority. Who can remember to eat when you’re so busy striding off purposefully to “see what you can see”? She and Shane work their way past some fighting extras until they arrive in the woods. They watch as a fleet of green-screen jets “Napalm” Atlanta, which Lori is all gaspy over while Shane hair-grab comforts her. In addition to that revelation not being shocking, it also doesn’t have anything to do with the rest of the episode. That scene must have been shot first season, back when this show was still about the end of the world. Then when they decided to make it a new show about a hunt for a missing child, they didn’t want to just throw that scene away and so they stuck it in the beginning, before the credits, hoping no one would notice. I know that I have compared viewing this show as akin to feeling like one of the survivors on a constant quest for hope. Now that we have seen how bumbling this particular crew of survivors are, I feel like that metaphor applies more to the writers. I’m not sure I have ever felt in the hands of more hapless bunch. It takes a unique talent to have strayed this far. If I’d taken a survey last year that asked, “What would you like to happen on a show about zombies?” I never in a million years would’ve been able to answer, “Oh, that’s easy. I definitely think at least five episodes out of five episodes should be devoted to searching for a character who has spoken maybe ten lines throughout the entire show.” Even the shows’ own characters are begging them to give up on her. “It’s a simple case of math,” says Shane, “Sophia only matters to the degree that she doesn’t drag the rest of us down.” And they have run out of imaginary places to keep looking for her. In the newest laying of the map down on the hood of the car scene (are there no coffee tables inside the house? ), Rick’s voice just trails off when he’s trying to come up with places to assign Andrea and T-Dogg. Also, a new character, Jimmy, joins in on the search, whom I’m just going to call Paolo because his abrupt entrance reminded me of that episode of Lost where twelve seasons in they just decide to let one of the extras talk. The other big drama of this episode relates to Daryl, whom I still like, even though his plotline was classic Walking Dead in the sense that everything that goes wrong is human-being- not zombie-related and feels not nearly as terrifying as it should. Daryl impales himself on his own arrow and falls down a cliff. He hallucinates Merle, who delivers a monologue about how it’s better for Daryl to go back to being a redneck stereotype, but hopefully Daryl won’t listen. Stay strong, Daryl! We need you! He wakes up to find a zombie sort of noshing on his foot but not actually taking a bite? Daryl takes that zombie and another one out. He cuts off their ears and fashions them into a necklace that I think is supposed to signal that Daryl’s gone feral, but which also strikes me as a savvy survivalist move; presumably the ears still smell like zombies and that could help him blend in (of course, later on in the episode Rick and crew pulls those ears off — fashion first, survival second). Then Daryl struggles for multiple scenes to climb up and out of what appears to be tiny hill full toeholds and sturdy hanging branches perfect for grabbing onto. They make such a big deal about how steep it is that it feels like watching a kid’s homemade film where they have to keep switching the angles to create the illusion of tension or otherwise you will see that it was just shot in their backyard. Daryl finally makes it up, but when he arrives at the Farm he is shot by the gun-crazy Andrea. Because of course he is. Everyone is overjoyed that he found Sophia’s doll face down in a creek bed crawling with zombies. It’s the “first hard evidence” they’ve had. Unless, of course, you count that farmhouse with the freshly slept-in child-size bed that they’ve decided to never return to again. This is a show that likes its episodes to have themes and I’m pretty sure this one was about the meaning of kin. Merle keeps reminding Daryl that they’re brothers. Hershel points out that PaoloJimmy isn’t his kin, but he needs to look out for him anyway. Lori cries for one full minute at a sleeping Carl’s bedside because she’s secretly pregnant with his brother or sister. And there’s a tête-à-tête between Hershel and Rick about controlling their own people, even though it’s clear no one is listening to either of them. I’m sure there’s a message to be gleaned in this about how it’s impossible to control anything in the midst of chaos, but I’m growing tired of having to extract such messages from such rubble. The episode ends with everyone dining together except the convalescing Carl and Daryl. Glenn is at the kids’ table with Maggie. She hands him a note asking him to pick a place for them to meet up tonight. He produces a pen out of thin air and writes something, but she apparently chooses not to open it until hours later, after dinner, dessert, and coffee are finished and the dishes are done. 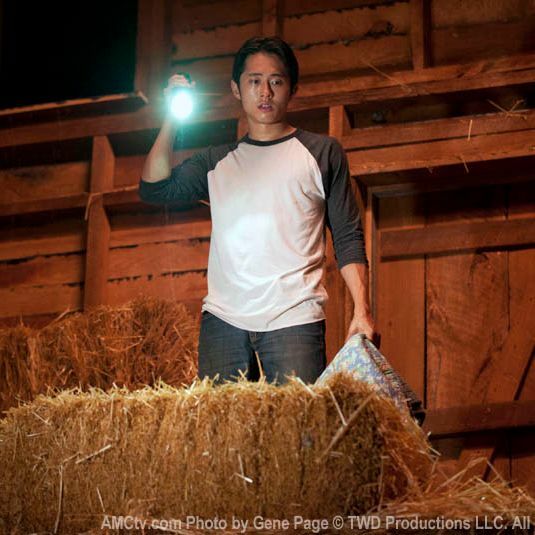 When she does, she realizes that Glenn’s headed for the hayloft and she tries to get there before he does but too late, he’s already seen the dozen or so zombies wandering around inside. And then there’s a shot of the utterly still padlocked door that we just saw a minute ago now clanging and pulsating. I guess the brainless zombies were napping until now. It’s really such a shame that they unveiled it so sloppily and insisted on sticking it at the end of the episode, soap-opera-cliff-hanger-style, because, done well, it could’ve had both emotional impact and been scary as hell. Another great twist totally blown. To paraphrase an earlier line from Hershel, it’s a wonder this show has survived this long without learning a thing. My theory about the zombies in the barn is that they’re family members whom they couldn’t bring themselves to kill, and so they decided to keep them penned up in the hopes that there would eventually be a cure. I say that, though, as someone who hasn’t read the comic books and so it’s just a theory. If you have read the comic books, please try not to leave spoilers as to what happens in them in the comments section. The Lori baby-daddy question doesn’t deserve its own bullet point.